Welcome to our farm. For whatever reason you were drawn here, we hope you enjoy your visit. We make it a practice of updating our site often, so if you are a regular visitor and have us bookmarked, refresh your browser often. Thank you for visiting our website. Bay Haven Farm is situated on nearly 40 acres at the base of the Blue Ridge Mountains. It is a lovely location with mountain views in three directions. The Blue Ridge does not only appear within a stones throw to our very immediate west, but continues to stretch further in the distance to the southwest as it borders the Shenandoah River. In spite of civilization seemingly closing in quicker than we’d like, we find a great amount of peace and solitude perched on our 40 acre high spot at the base of the Blue Ridge. The farm is currently home to several Cleveland Bay Horses, several working livestock guard dogs, and a small herd of cattle. This resident list would not be complete without the large gaggle of Free Range Turkeys that are raised seasonally for the Thanksgiving holiday. 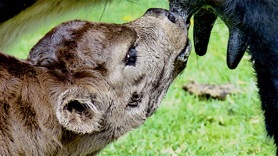 Come spring time and the arrival of foals, calves and Thanksgiving turkey poults the number of residents on the farm increases considerably. We work the farm and care for all the animals ourselves as a small human family of four. We have arranged our farm so that our animals can all live out naturally on pasture with access to plenty of forage and field shelter. The barn is usually only occupied during cold weather foaling or on the rare occasion of injury. The theme of the homestead is unmistakeable with it’s modest reproduction farmhouse in dark gray with white trim and it’s out-buildings all with bright red paint and white trim. Our home is a small New England style historic reproduction salt box noticeably smaller than the barn that sits less than 100 yards away. The property has been a work in progress since we purchased it as raw land in April of 2004. Early in 2003 we began our Cleveland Bay breeding program. We searched long and hard to find just the right breed. As we became more focused on the Cleveland Bay we took a trip to Wales, UK late in 2002. It was at this time, after meeting some very gracious Cleveland Bay people and their amazing horses, we knew more than ever that this was definitely the breed for us. Now, 17 years later, we are pleased with the strides and accomplishments we have made with the breed and the friendships we have developed with those who solidified our interest and have encouraged us along the way. Our horses live out with the stallion, mares and foals all living together in a herd environment. 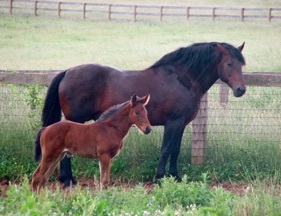 (pictured above with a young filly foal is our stallion, Joe). During this time we became the largest producer of pure bred Cleveland Bays in North America; and in some instances when 8 foals were born in a year were the largest single producer in the world. We are pleased with the contributions we have made to the breed and the population. In the last couple of years we have made a decision to downsize our Cleveland Bay breeding operation and will only produce a couple foals a year now going forward for as long as our more senior Clevelands choose to and are able to. We have had a number of livestock guard dogs over the years. 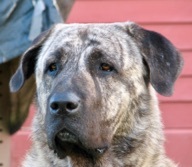 Our current canid livestock protection unit consists of Jeb (brindle pictured below), Oz (pictured middle below), Floki, and a single Boerboel; Caesar. Jeb and Caesar reside in the barnyard. 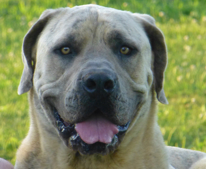 At soon to be 8 years old Jeb has reached geriatrics (this is old for a 140 lb dog). Oz, also well into his golden years, will be 9 years old this next year and does his best to look after the hens and the seasonal turkeys. Caesar (with big smile pictured below) although now 6 years old does the best he can with bad hips and elbows. He has finally learned to stop torturing the hens and is a nice companion for Jeb at the barnyard and the two are good buddies. Caesar has a head the size of a watermelon (the big kind, not the small round seedless ones) and in spite of his physical limitations his heart is (figuratively) as large as his head. Floki (145 lb. Kangal dog) stays close to the house and manages to look after and patrol all the other fields with Finn (pictured roosting in my truck). Finn is not really a farm dog; although he has taken well to droving the cattle. Finn is Floki’s companion and my occasional running & rucking partner. Although most predators know to stay away and go “around” our fencing, Flok and Finn manage to take care of the unwelcome ground hogs, opossums, raccoons and the occasional fox. The foxes and coyotes usually steer clear as the dogs on duty at the farm are constantly reminding them its best that they not to choose to pass through. Although most of the crew has now grown elderly (and in Caesars case a little bit broken) we adore them. 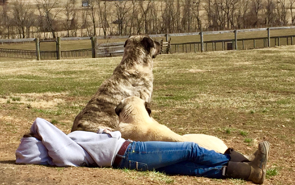 They are not just livestock guardians, they are family.